Situated in the trendy neighbourhood of Chelsea in Manhattan, this addition to Vikram Chatwal Hotels combines elements of chic and cool with modern elegance. Originally designed by architect Albert Ledner in 1966 as an annex to the headquarters for National Maritime Union of America, both the exterior and the interior of the building have now been transformed into the 17,093 sq m Dream Downtown hotel by Handel Architects. The agency has fused the original maritime inspiration with a feeling of cool otherness while avoiding an overtly nostalgic nautical theme. The block-wide hotel has two facades, both clad in stainless steel. The wall of the main entrance on 16th Street used to be blank but now boasts two perforated stainlesssteel layers. The outer rain screen peels up at ground level and forms the hotel's canopy. 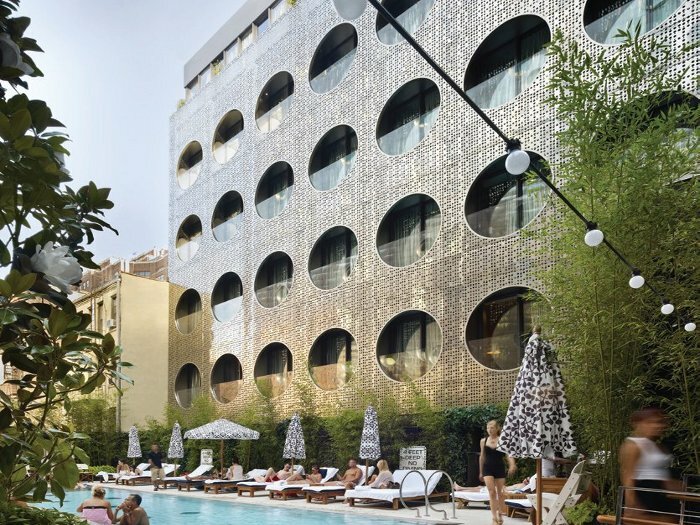 The second facade, on the 17th Street, features porthole windows and stainless steel tiles, which shimmer in the sun and seem to disappear under certain light conditions, thus creating an illusion of portholes floating like bubbles. Handel Architects decided to throw off the balance the original symmetrical rows of porthole windows by creating two new and irregularly spaced portholes to each original one. 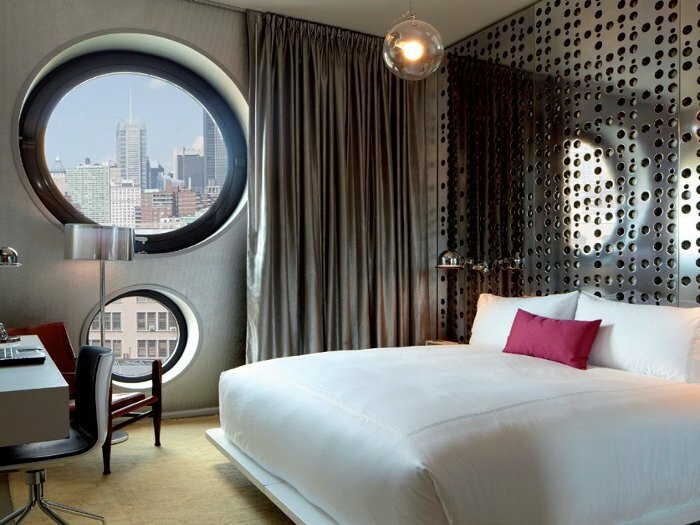 The circular shapes inspired by the porthole windows are prominent features throughout the hotel. 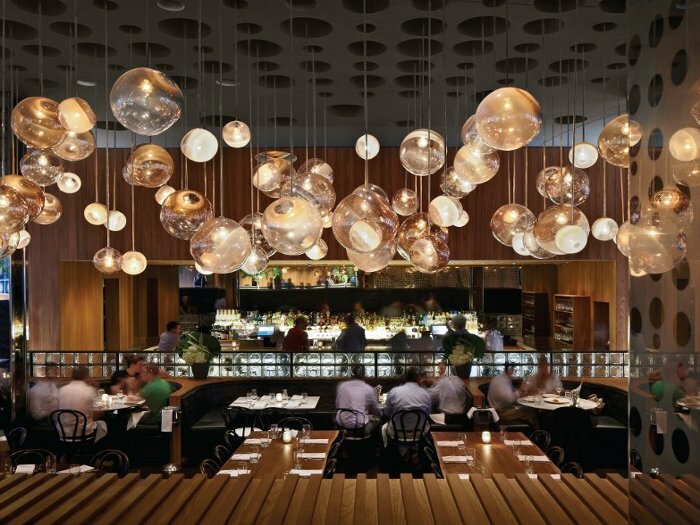 For example, there are the 200 handblown glass globes by John Pomp Studios that float above the lobby and the restaurant, creating an impression of a cloud of lights. But there were some creative challenges, as the original through-block architecture of the building presented limited opportunities to use natural daylight. As a solution, four floors were removed to create a lightwell, while at the same time making room for a pool terrace, balconies and allowing for new windows to be placed in guest rooms. 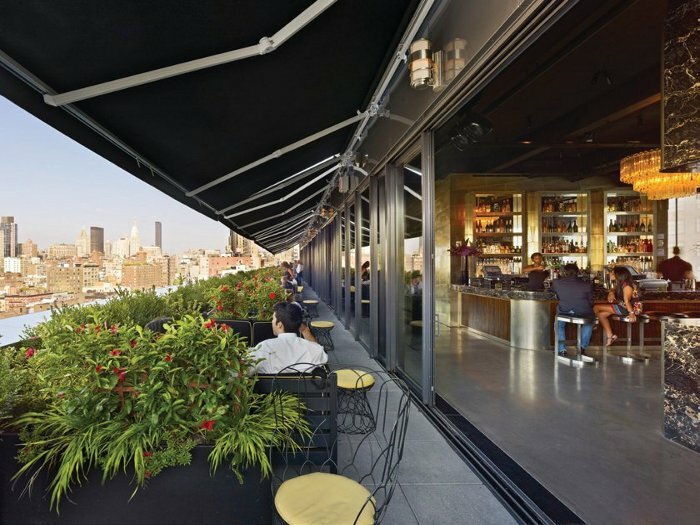 It also enabled the creation of two new floors of guest rooms in the south side of the building and a glass-enclosed roof-top lounge with a terrace on the north side, where sliding glass walls blur boundaries between the lounge and terrace. The pool area acts as something of an interior design element. Above the lobby area, glass porthole windows in the base of the pool allow visitors downstairs to cast a glimpse upwards and the other way around. In addition, the light coming through the water and portholes creates a shimmering effect in the lobby. All the fixtures and furnishings in the hotel's public spaces and 316 guest rooms - including 16 suites - have been designed and customfitted to complement the unusual exterior design. The general colour scheme throughout plays with layers of silver, black and white, which have been balanced with warm teak wood. For accent, bright pop colours have been added in the shape of accessories and artwork, such as a print of Spectrum, by Richard Phillips, in one of the guest rooms. Combining architectural history with modern design has resulted in a fascinating project that marks a new era in the building's life.